Even as the average cost of solar is dropping to the point where it’s now equal to, or less than, the cost of grid electricity in many large US cities, going solar is still a bit beyond the reach of many Americans with low to moderate incomes. And for renters and others without adequate rooftop access for installing solar panels, choosing solar energy isn’t nearly as simple as it needs to be in order to fully leverage the benefits of access to clean renewable electricity for both cost-cutting purposes and reducing the environmental impacts of energy generation. However, that may begin to shift soon, thanks to a recent White House announcement about an initiative targeted to increasing access to solar energy for low- to moderate-income homes and communities. The solar initiative, which includes a number of different components in the form of both executive actions and private sector commitments, covers a wide range of approaches, from boosting community solar programs to providing technical assistance for installing solar on affordable housing to committing to installing more solar arrays on federally subsidized housing. In addition, the White House solar initiative also aims to increase solar training and workforce opportunities, which is right in line with President Obama’s goal of training some 75,000 workers to enter the growing solar industry by the year 2020, as well as his Solar Ready Vets program that is designed to help transition military personnel to the solar industry after leaving the service. This new solar initiative encompasses a diverse mix of elements, some of which include energy efficiency measures and projects designed to scale up both community solar and residential solar programs, funded through a combination of investments from impact investors and state and local municipalities. 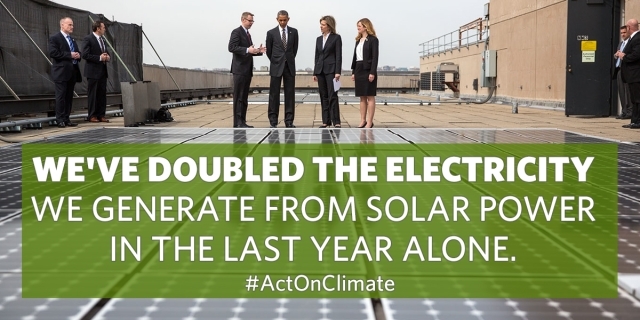 The full details about this national solar program are listed on a fact sheet on the White House website. Shortly after the White House solar announcement, the office of Senator Bernie Sanders also announced the introduction of a piece of legislation designed to boost solar energy deployment for low-income families, called the Low Income Solar Act of 2015. This proposed bill, if passed, would address the issue through the US Department of Energy, by providing $200 million in loans and grants that would help to offset the upfront costs of solar on low-income family homes, community buildings, and public housing. The bill also includes provisions for prioritizing solar loans for women- and minority-owned small businesses, as well as helping to fund the development of solar arrays on Indian tribal lands, Alaskan native communities, and in Appalachia. Find out what solar can do for you today! It’s fast, easy, and free!